So the sun has come out to play, the rise in temperature makes everyone (apart from mad people and lizards) wear less clothing. All the folks trying to loose weight to get that summer body now have a chance of showing it off, even though the love handles are still hanging around. All the magazines scream about dieting and “lose 10 pounds in a week” mentality. Guess what? You’ll never be happy, as soon as you’ve lost that 10 pounds you’ll be able to see your feet and that means you’ll have to get your nails fixed and those cracked heels otherwise you won’t be able to wear those sandals you bought for summer. Then you’ll find none of your clothes fit you and you’ll get depressed. So depressed that you’ll start to eat some ice cream and put that 10 pounds back on. So begins the vicious cycle. I’m of the belief that if you want to loose weight then you just eat less and move more. Sitting on the couch reading a book on how to loose weight isn’t going to help as much as walking to the swimming pool, doing a couple of lengths and walking home. You don’t need a guru, or a gym or any equipment for that matter. Just get out of your house, on foot. You never know you might meet someone interesting too. I’m not just saying this to be smug but using this method I’ve lost three and a half stone over the last few months, with thanks to Boards.ie fitness section too. Believe it or not cars suffer from weight problems too. The kerb weight of a car has a terrible effect on everything from 0-60 times, handling and economy. Every time you turn on your air con you use a little more fuel, add that to the fact you have a hulking great fridge under your bonnet and you get the idea. Years ago cars had nothing in them, so 100 horse power was enough for most cars, the Carina back in 1997 had 106hp and still managed to get over 40mpg if driven carefully. So why can’t cars 13 years later do much better? Kerb weight, that’s why. Cars have gotten more and more equipment in them, even the most basic car on the market today has air bags, air conditioning, abs, electric windows, crumple zones and god knows what else. So the Picasso, well the 1.6HDI engine puts out 110hp and that should be enough for any family car but somehow in the C4 it feels like 50hp have galloped away. Big heavy car and a small engine means you get a reported 46mpg, more like 35mpg in the real world. This is undoubtedly the prettiest small MPV on the road, there’s nothing else comes close to how it looks. The interior is a pleasant place to be the slide back sun visor is a good touch, as is the positioning of the driver controls, most things the driver needs are placed on the right side of the steering wheel as well as the middle of the car. The seats are comfortable in a way only the French can do. There are 5 full seats, all of which are movable, so there’s any amount of possible combinations for you to play with, there’s a 7 seat version too. There are boxes everywhere, so there’s somewhere to put everything. So what’s not to like? Well the steering for one, it’s too light and somehow doesn’t feel connected to the front wheels. The gearstick wobbles about, but that happens in all French cars. This is not a driver’s car; this is a very comfortable way of transporting you and your family around. If I was picking one to buy it would be the 2.0ltr diesel with air suspension, there’s better fuel economy and a bit more pulling power, plus you get some more toys to play with. 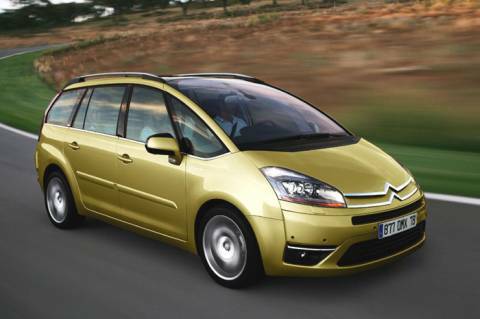 So if you want great styling in a big heavy car then the C4 Picasso is for you.